Hi lovelies. Today's post is another 26 Great Nail Art Ideas mani, this time the prompt is 'Blue Floral'. You might notice that I am posting this a few days early. I've got so many good posts coming up that I thought I'd squeeze this in now. 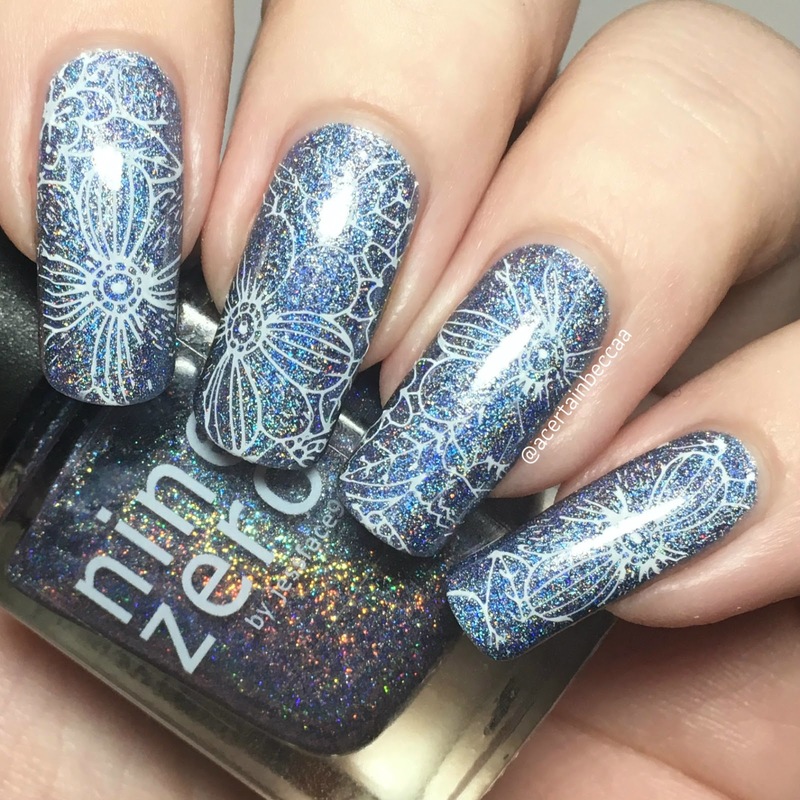 I stamped flowers over Nine Zero Lacquer 'February 2016', which I had worn to match my nail bestie Kirsty (FairyTales Nails) when we met up last week. Read on for more info! Nine Zero Lacquer 'February 2016' is a periwinkle blue holographic with adding holographic silver microglitters. This is super smooth and easy to apply, and has a nice opacity. It covers completely in two quick coats. 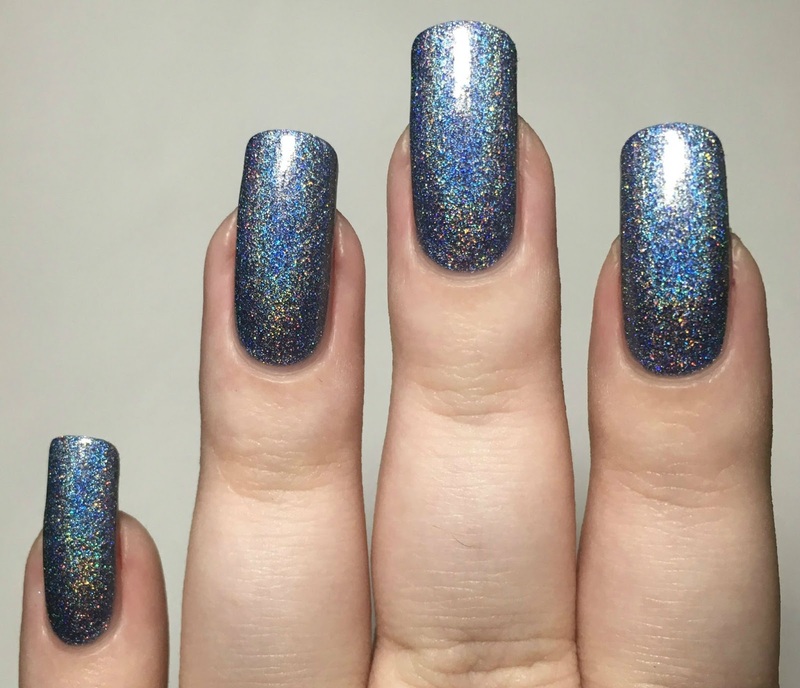 The holographic in this is just gorgeous. Below is two coats and topcoat. For my flowers, I used the big buffet flower image from Uberchic Beauty stamping plate 9-03. I used my Born Pretty Store clear stamper and scraper, and Hit The Bottle 'Snowed In'. I stamped over all of my nails, aiming for a slightly different part of the image each time - although I did seem to gravitate towards the big flower. I let it dry for a few minutes before finishing with topcoat. What do you think? 'February 2016' is gorgeous! I can't say I have many polishes (or even any) in the same shade. I also quite like how the stamping has come out, it's quite delicate and subtle. It really makes me think of the spring time, let's hope the weather warms up soon! I can't wait to see what everyone else comes up with for this theme. I love this polish and your florals are so adorable! *fingers crossed* for better weather! Very pretty! I love the floral image you went with! That base colour is gorgeous and I love the stamping you did over it! I love this! The stamping adds art and variety without obscuring the polish. Well done! This colour polish is amazing and I agree that the stamping is beautiful! Beautiful mani. 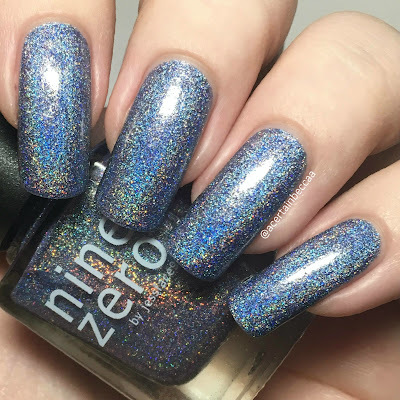 I've seen and own so many holo polishes but this shade is so unique and beautiful! What a beautiful blue! I love that the white pops without distracting from the holo. 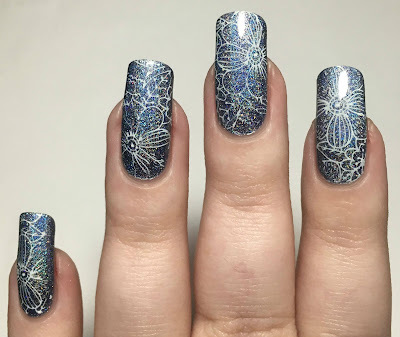 The base was just perfect for your stamping! The base is gorgeous & I love the floral!